Arbequina Olives are the most popular of All Olive Trees. These evergreen trees are self-fruitful and produce abundantly. A tree is capable of producing up to 20 pounds of fruit per year. The highly aromatic, small, dark brown fruits are small and very flavorful. They can be used as a table olive but are also known for their high oil content, making them an ideal fruit for olive oil production. The Oil from the seeds is of the highest quality. Our Olive trees are grown from proven fruiting wood and are at fruit bearing age. They blossom in the Spring and the fruit will ripen to a smaller, dark fruit in the later part of Summer. 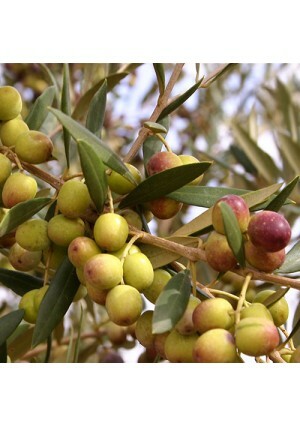 Arbequina Olives are very adaptable and can be grown in all areas of the United States as a container-grown tree. The Olive is cold hardy in USDA Zones 9 - 11. They can be kept as a container-grown plant in all other growing zones if brought indoors for the winter. When planted in the ground Arbequina Olives can reach heights up to 20 feet. Space the trees 12 feet apart. When container-grown they will reach a height of 5-6 feet tall. Arbequina Olive Trees require warm temperatures. It is preferable to keep the trees in temperatures above 50 degrees so they do not drop their leaves or fruit. Produces beautiful & aromatic fruit all year long! Available in the Continental United States Only.